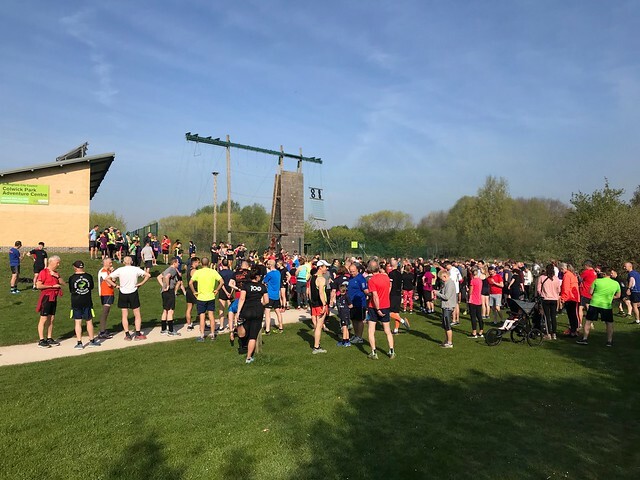 A magnificent 353 participants joined us (that's our 8th highest attendance ever and meant that Dan won parkrun bingo) and 52 of those were either new to our course or brand new to parkrun this morning. 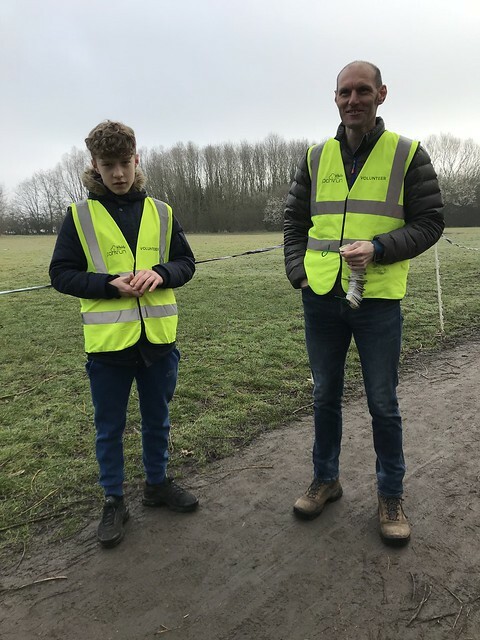 An awesome 26 volunteers, 8 of whom are aged 18 or under, slipped into the hi-vis jackets to help make the magic happen. 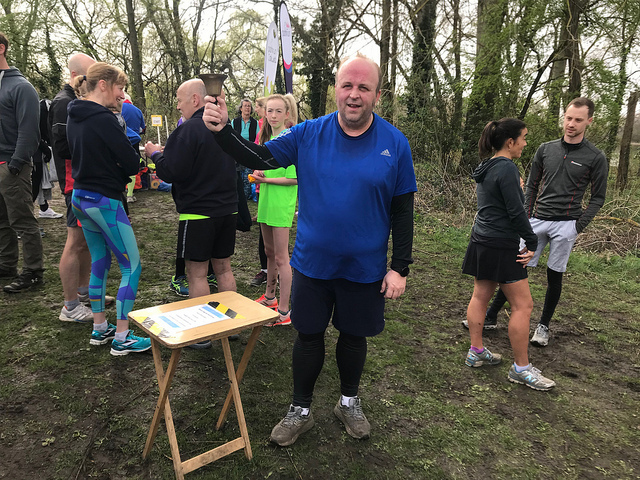 At the pre-run brief we wished James Billington a very happy 40th birthday (as he steps up an age category) and we congratulated Georgina Hawkins on her 50th parkrun today! Our bell rang frequently this morning as our field took advantage of firmer ground and knocked out 59 personal bests. Congratulations to you all! 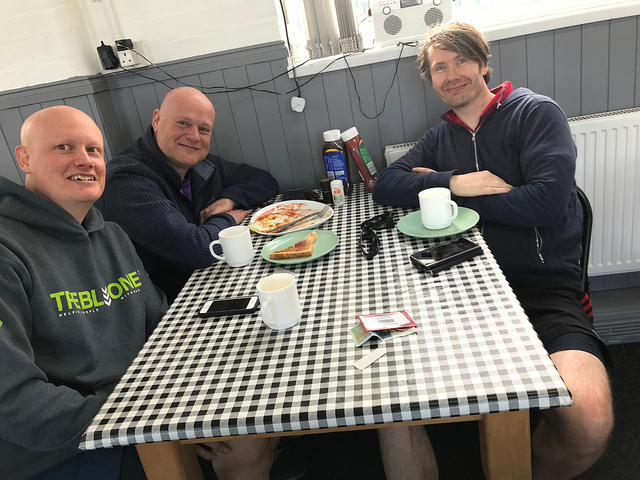 Despite a reminder in the pre-run brief two position tokens escaped today...but we were delighted to be able to reunite Vil with his lost barcode and bike key. Huge thanks to the following people who volunteered in various roles this morning... Abigail CAST • Andrew PHILLIPS • Auangfa HURST • Bernard JARVIS • Catherine CAST • Cathy WISER • Chris JEKIEL • Daniel CORDLE • Emily DIGMAN • Finlay HOOD • Frazer HOOD • Grace & George SMYTHE • Grace PHILLIPS • Harry NICHOLLS • Helen HOOD • Helen JEKIEL • Karin HURST • Mark ROSE • Miri LEWIS • Niki WARD • Philip MOORE • Rachel MOLLOY • Sandy WATERLOW • Steve JEPSON • Tim SORRELL and Tracey MOORE. 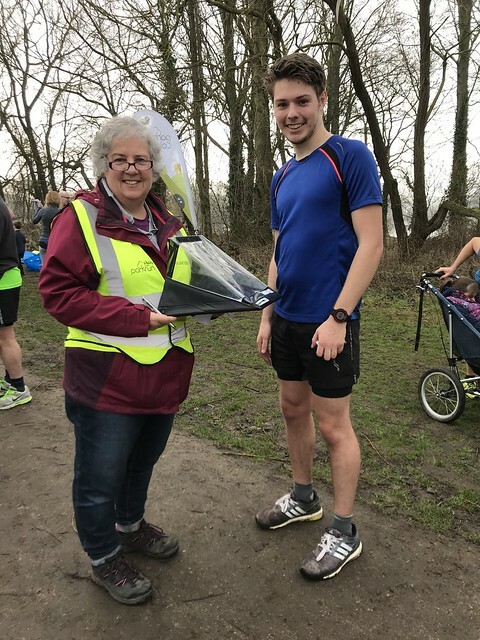 A special mention for Tracey who completed her 25th volunteer stint and joined the V25 Club last weekend. One purple parkrun t-shirt coming her way! As Mark Twain once observed, “In the spring I have counted one hundred and thirty-six different kinds of weather inside of four and twenty hours." And so it seemed for most of the weekend, but luckily for us, event #406 seemed blessed with a window of the most beautiful, sunny weather; April’s rare, capricious loveliness was definitely on full display. It was one of those days when the glitter of winter shines through a pale haze of spring, and we are reluctantly obliged to scrape the ice off the car windscreen before heading to the park, where we crunched over what we hope will be the last frosts of the winter. 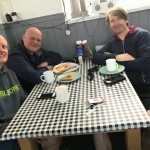 Colwick may have acquired something of a reputation for a somewhat relaxed approach towards the 9am start time. 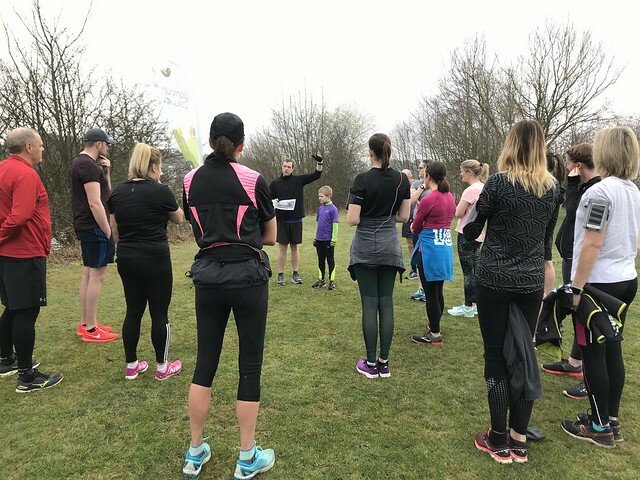 Not this week: the 21 eager volunteers were all in place at the start line before any of the runners and Tony was able to get the First Timers’ Brief underway in good time for a prompt start. We were very pleased to welcome 28 first timers, including tourists from Daventry and Milton Keynes. As well as welcoming Mark and the rest of his stag party, we had some milestones to celebrate: Anne and Sarah ran their 50th parkruns and Friedel and Alun ran their 100th parkruns. 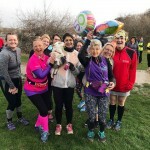 We look forward to seeing you all in your splendid new milestone t-shirts very soon, and an especial thank you to Friedel for bringing such a lovely spread of cakes and goodies to share with everyone at the finish line. To slightly misquote the Bard, when it comes to home-baked peanut butter biscuits, it is certainly true that “well-apparel'd April on the heel of limping Winter treads." We were well apparel'd indeed. 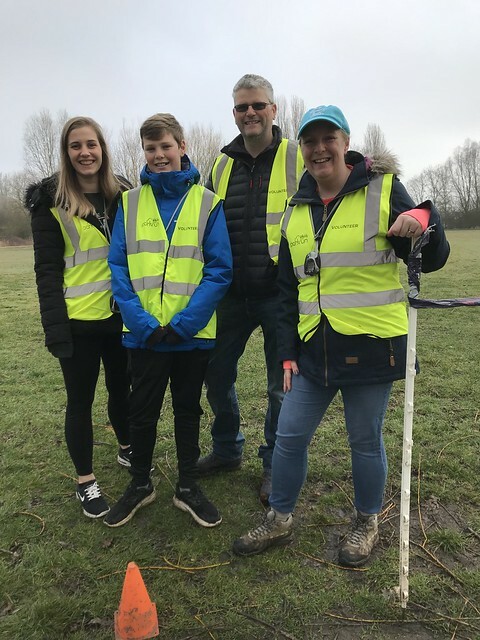 As always, parkrun wouldn’t be possible without the contributions of the volunteers. This week’s high-viz heroes made the magic happen with no fuss at all. Super Kev carried out the Event Day Course Check to make sure everything was in order. Claire and Steve were your timers. Tony, Emma and Ollie ran an immaculate finishing funnel. Josh and Chris scanned all the barcodes as Sandra maintained order on the clipboard (even without her reading glasses!). 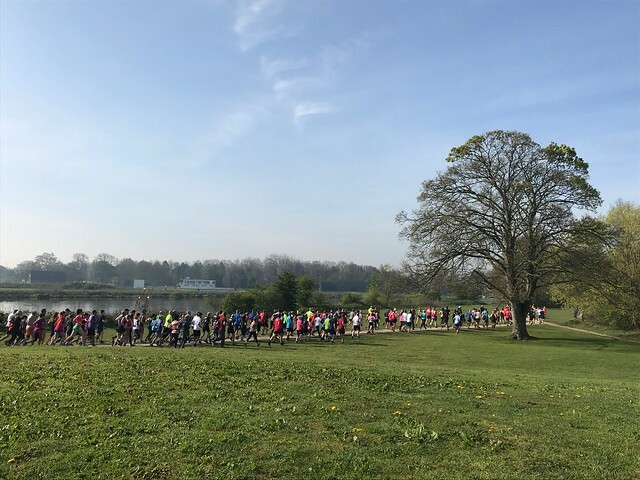 All 278 of you were safely marshalled around the course by Joshua and Debbie, Eileen, Pauline and Caitlin. It’s much more than just pointing and clapping, you know. We had 59 PB's, so the course must be firming up for the summer. Well done to you all. Tailwalkers were Judith and Julie. 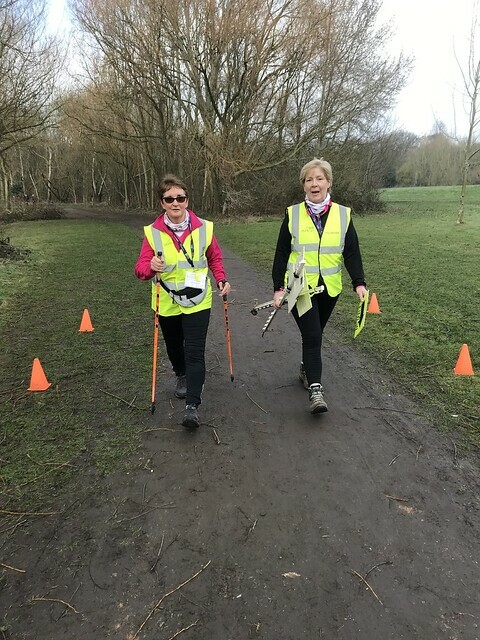 Abigail guided Terry safely around the course and described how Colwick Country Park is bursting into life with the coming of Spring. Where the wood fumes up and the watery, flickering rushes’. Well, perhaps not exactly in those terms…. I'm not sure Terry is a big poetry fan (he's from Yorkshire)... But something similar, I’m sure. Tim was your Run Director. Soggy legs and a muddy petticoat? 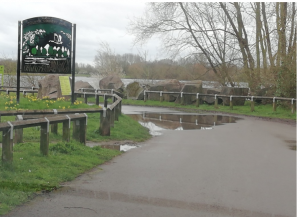 Yeah... that's running at Colwick alright. Every spring is the only spring - a perpetual astonishment. Remember April and smile. The alarm breaks the nights slumber with the shrill reminder that it's parkrun day. 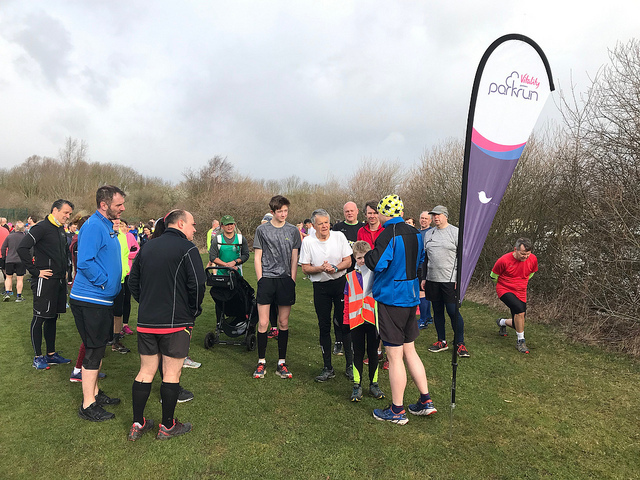 For many the most important day of the week, as it's not just the day we get another tick for running, walking or being a hi-viz hero, it's the day when the community comes together for chat and cake. 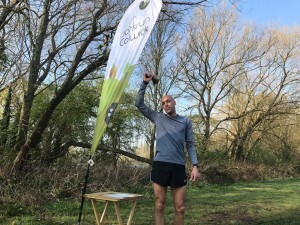 Colwick country park welcomed runners and walkers with a subdued sky which would slowly break and became bathed in subtle early spring sunshine, with a slight breeze across the lake, we had almost perfect conditions. 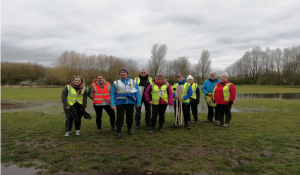 With the ever present pooches barking away in the background, Super Kev got proceedings moving once Helly J had introduced our awesome 1st timers to Colwick. 3 milestones to acknowledge, with Sophie on 50, myself on 100 (at long last) and Harjit trumping us both on 250. Dutiful notices applied and a simple countdown and we are let loose. 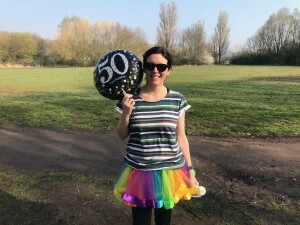 People have obviously seen my pile of cakes to mark the milestone, and there is a huge launch off the line as people consider their times and the prospect of some sticky jammy cake. Course conditions were dry, which is nice to see as the last time I was at my home course, my shoes needed hosing down. So a good day to get a PB. Of which 69 slam dunked the ball and bagged a brand new 5k time. Congrats to all 69 of you. Some great cheering from the Hi-Viz Heroes, no doubt plenty of hi-5ing to boot. As you read this, give them all some further applause, and remember that parkrun doesn't happen without those donning bright yellow. Well done to you both. Off to the Daleside for a well deserved celebratory brekkie, cuppa and chat. 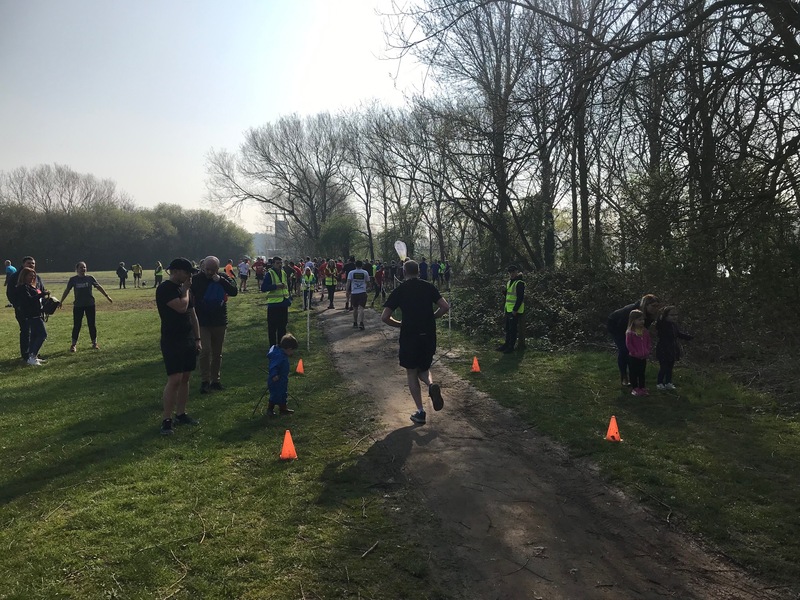 Another set of parkrun ticks for 304 lycra clad peeps and 24 volunteers, see you next time in black! 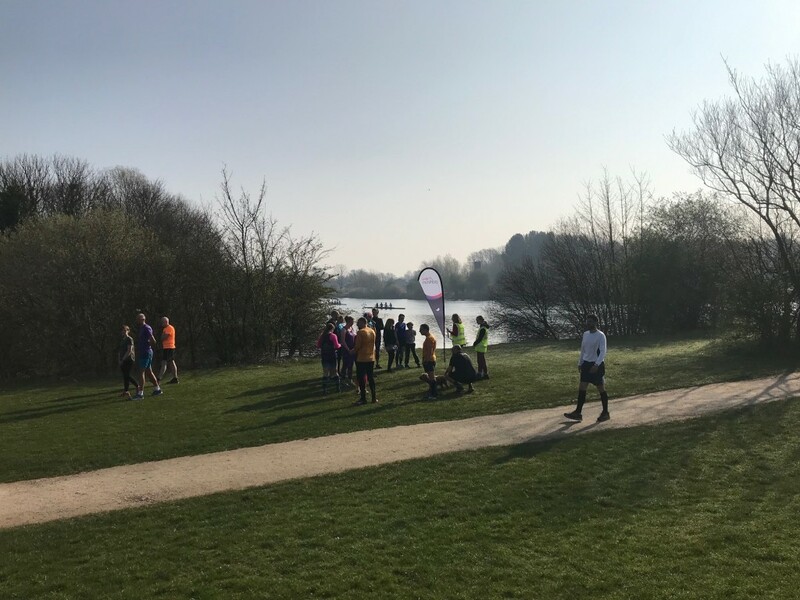 The fine weather was enjoyed by 309 parkrunners, 39 of whom were first time visitors to Colwick including tourists from Belton Park, Wakefield and South Africa! An impressive 55 people took full advantage of Colwick Park at its most welcoming by smashing out PB’s. 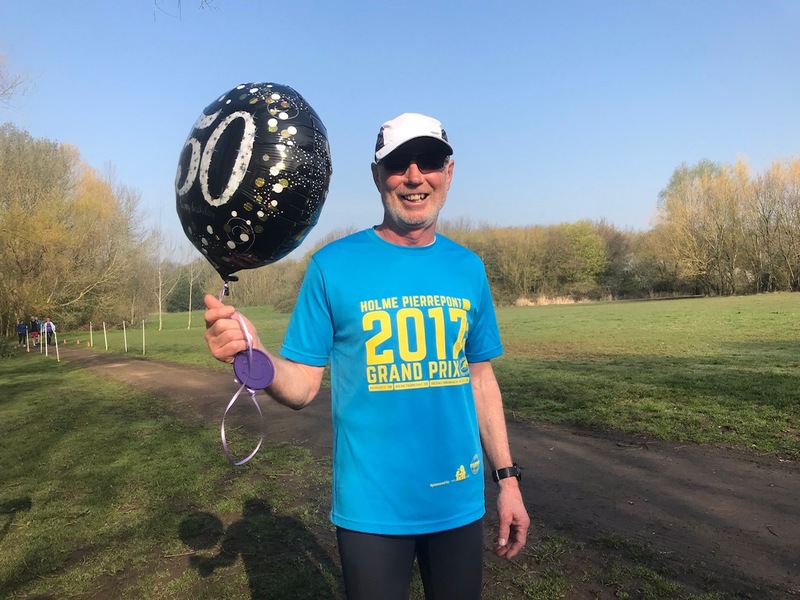 Ele Bennett celebrated a 50 milestone, and Phillip Hall brought balloons and cake along to celebrate hitting his 50th last week! 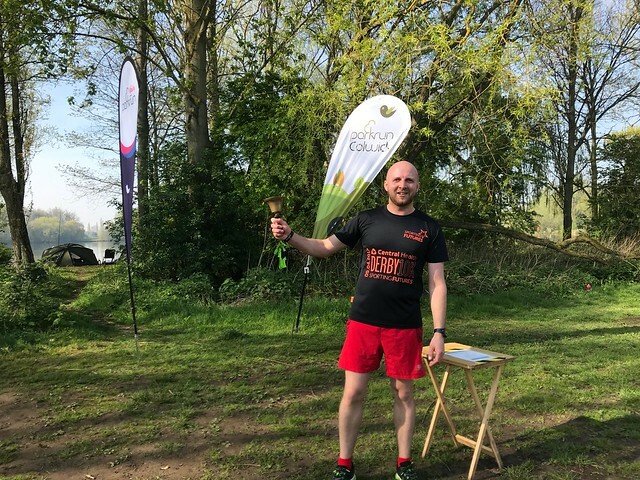 Summer is up folks….bring on Hawaiian shirt parkrunday! Event 403 was nice. Nice people... nice weather... and nice things happened. 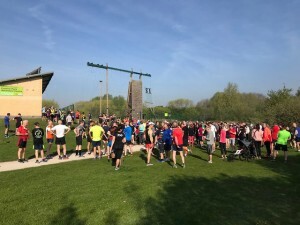 We were delighted to welcome a total of 301 participants, of which 29 were new to Colwick and 9 were brand new to parkrun. We had a first today... as having gone for a warm up with Harriet, his guide for the day, Terry nearly missed his own tourist and first timer brief! 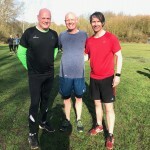 and we gave a shout out to Andrew and George who'd joined the 250 Club and 100 Club respectively on tour at Wimpole parkrun last week. Other nice things happened... two keys were found and returned to their rightful owners, one bag was left behind but repatriated before we left the park, several items of lost property were collected, and people said rather nice things about our parkrun and the community we have built here. 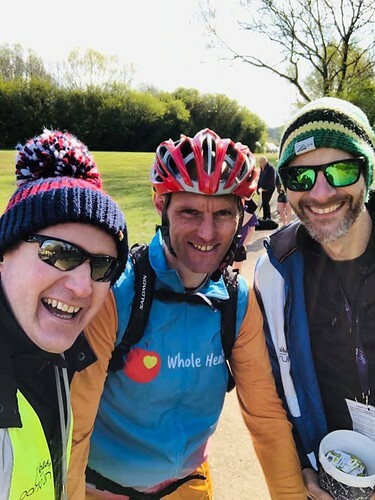 Despite Event 403 being so nice... we did receive a couple of complaints via two of our marshals that a walker was nearly knocked over, and that a biker was sworn at. We apologised profusely... and would ask everyone to be considerate as they pass through the park please. It's very rare we get any negative feedback, and we'd like to keep it that way. Please also remember that the speed limit is 10mph around the park roads, thank you. To finish on a wholly positive note... our volunteers were really nice! Take a bow: Abigail CAST • Andrew PHILLIPS • Angie ALBERY • Chris JEKIEL • Emily DIGMAN • Finlay HOOD • Frazer HOOD • Gideon NUKPORTI • Grace PHILLIPS • Harriet JONES • Helen HOOD • Helen JEKIEL • Helen MARSHALL • Iris PEEL • Jacques SARAZIN • Lauren WHITMORE • Miri LEWIS • Niki WARD • Philip MOORE • Ruth BRANDON • Sandy WATERLOW • Steve JEPSON • Terry RODGERS • Thomas MOORE • Tim SORRELL • Tracey MOORE • Trevor PEEL. 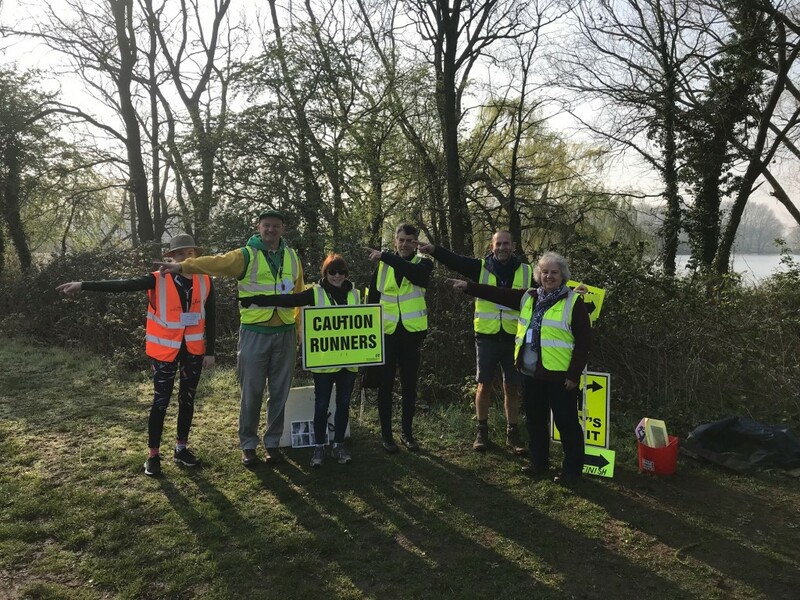 If you'd like to be nice in hi-vis please get in touch. 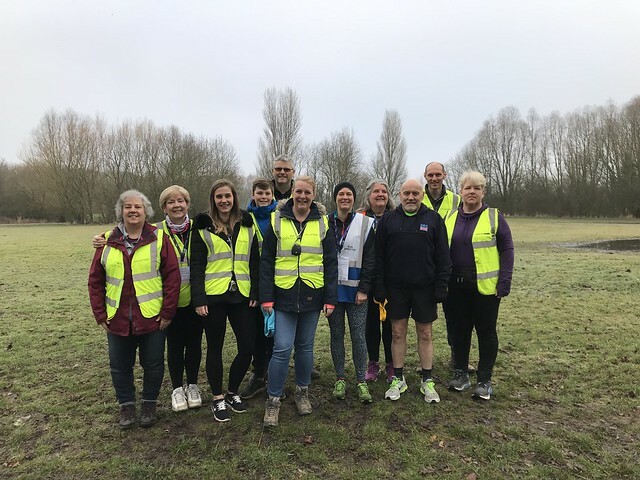 You can read more about volunteering here and see the current state of the volunteer roster here. 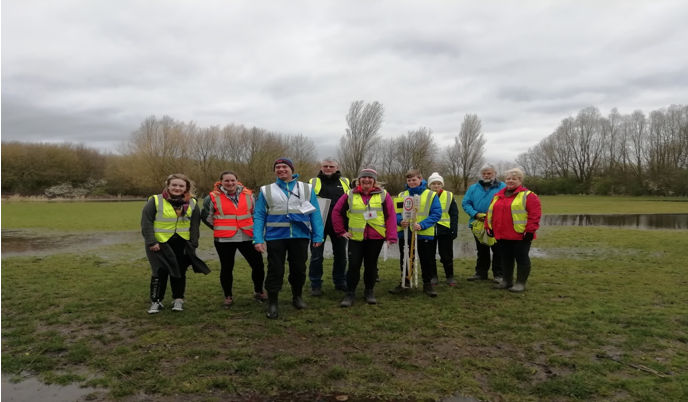 At event 402 a total 247 people became intrepid explorers around Colwick Park. Colwick is infamous for its puddles and today it truly didn't disappoint. James and I knew we were definitely in for a challenging parkrun on our arrival by the size of the puddle at the entrance to the park. We had plenty of puddles, mud everywhere and a forceful gale into your face down to the hairpin bend and for the first time since we can remember a slight course alteration due to the fallen tree near to the hairpin bend, thanks to our marshal for helping the regulars and newcomers find their way round the altered course. Remi had a well drilled team of volunteers helping to ensure today's event passed so smoothly. This event was made possible by 26 volunteers, take a bow for braving today's challenging conditions: Alexandro LEONE • Andrew PHILLIPS • Anthony DEANE • Anthony MADGE • Caitlin SORRELL • David ROBINSON • Emily DIGMAN • Grace PHILLIPS • Helen HOOD • Iain HICKMAN • Jacques SARAZIN • James HICKMAN • Libby HARRISON • Lydia Rose DEANE • Matthew PICKLES • Miri LEWIS • Nathalie DUBOIS • Philip MOORE • Remi GAUVAIN • Rita ROBINSON • Stephen WELLS • Terry RODGERS • Thomas MOORE • Tim SORRELL and Tracey MOORE. 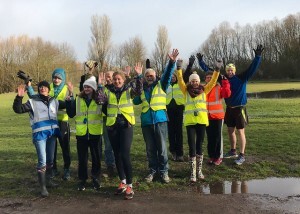 Just a thought for any first time readers and regulars of our run report, volunteering is really lots of fun. 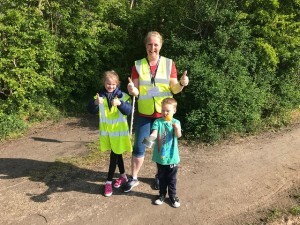 It took me a year and a half after my first parkrun before I volunteered and I've returned many times since as I've enjoyed so often being a high viz hero. 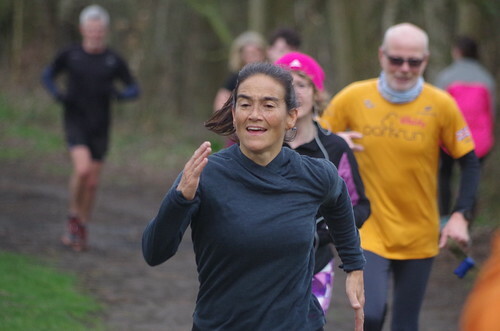 For me I love giving something back to parkrun that has given me so much during the last five and a half years. Terry expected an outbreak of tropical sunshine in his shades as he delivered the first timers & tourist briefing where he welcomed 45 first timers with his usual aplomb. 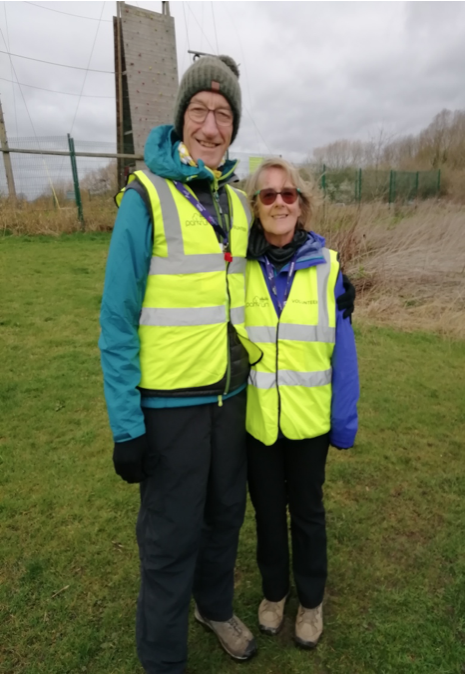 We were blessed with three tailwalkers today, Here are David and Rita Robinson all ready to get going and they were accompanied by Nathalie Dubois. 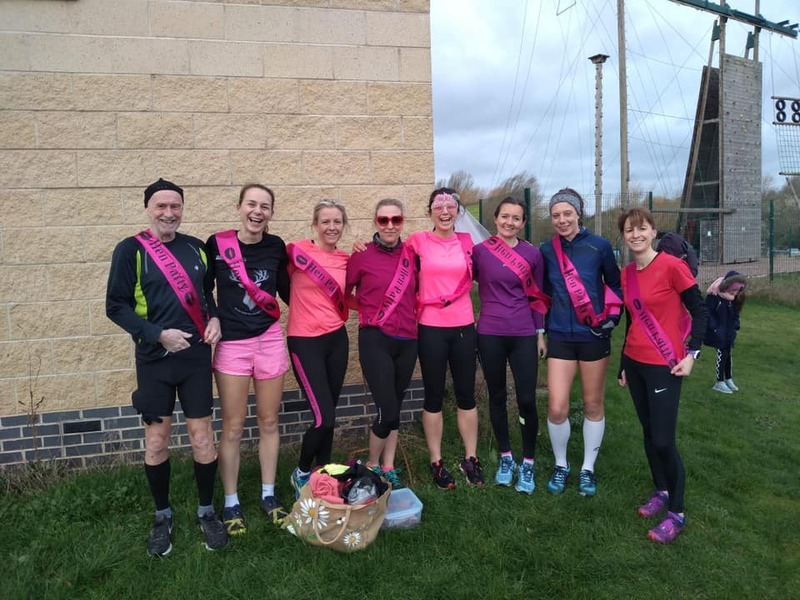 Today we were joined by Aimee and her friends on the first leg of her hen do, many thanks for starting your day of celebration by joining us at Colwick parkrun. We hope you enjoyed the rest of day. We also had a team of runners from Papplewick Green Runners this morning graduating from a Couch to 5k programme. We all hope you enjoyed your first parkrun and visit to Colwick parkrun, and join us again in the near future. 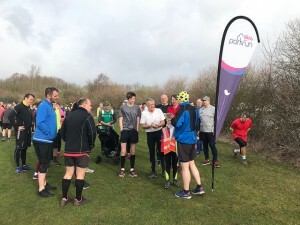 Somehow nine parkrunners managed to set a new PB, well done to all of you in very challenging conditions. 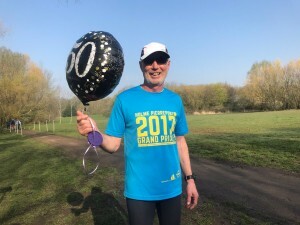 Alan Lewis celebrated running his 50th parkrun today, 42 of his runs have been with us here at Colwick, well done Alan we look forward to seeing you in your red 50 Club t-shirt in the future. 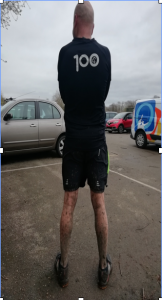 Our last word on the conditions today, Paul Smith kindly offered to model for us post-run and judging by the photo it looks like he will need a long shower to spruce those legs up ready for a return to Colwick parkrun next week. 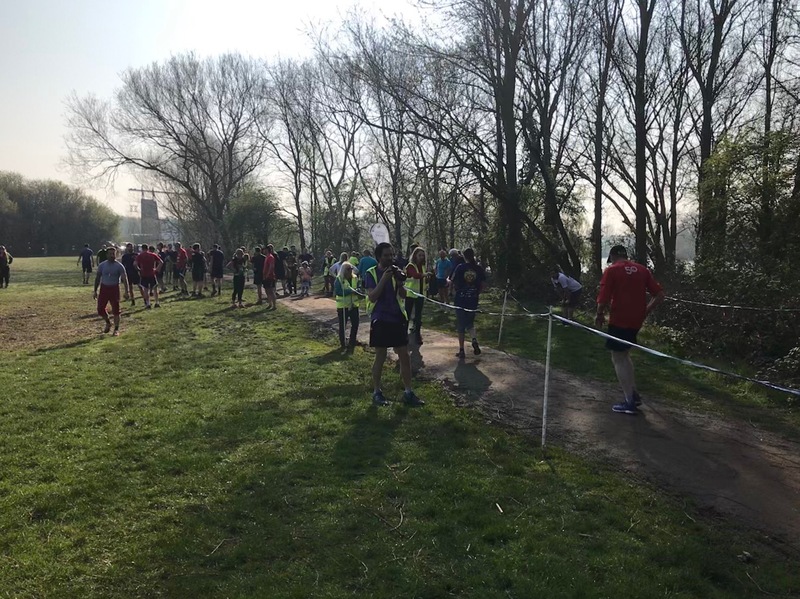 Today's full results and a complete events history can be found on the Colwick parkrun Results Page. We hope you all enjoyed today's event so much that hopefully with a little less wind you will join us for more fun at event number 403. 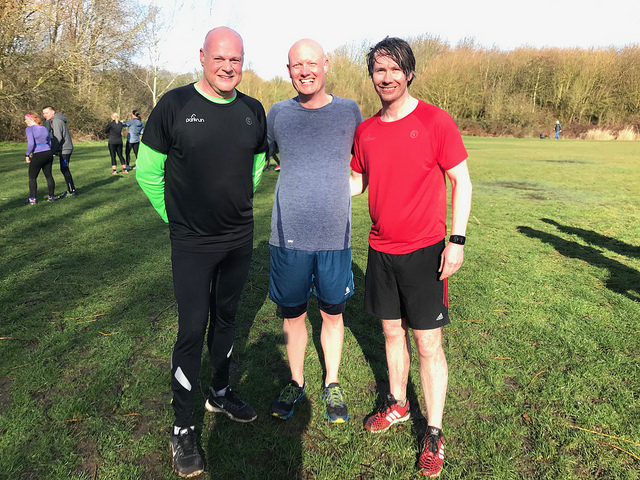 We've also enjoyed writing the run report for the first time, Iain & James Hickman. 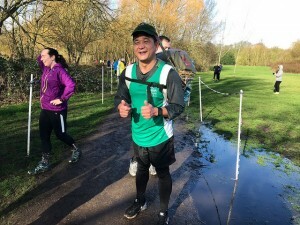 Also amongst the tourists was veteran Gurkha of 25 years Bishnu Singh who is planning to complete 207 parkruns carrying a 22kg Doko (traditional Nepalese basket) raising funds for the Gurkha Trust. You can read more about his challenge here. 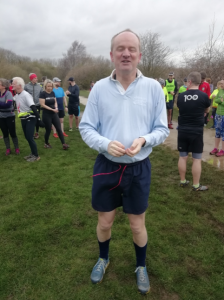 We had a look at his stats ahead of his visit and noticed that he usually did his parkruns in around 29 minutes. We suggested anyone looking for a sub-30 stuck with him and he didn't disappoint... coming in at 30:03. 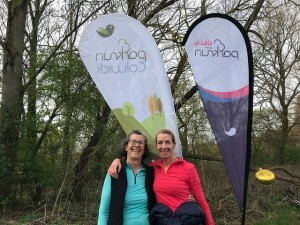 Congratulations to Michelle on her 100th parkrun and to Susan, Alison and Angie who all joined the 50 Club at Event 401. Frazer HOOD • Helen HOOD • Finlay HOOD • Andrew PHILLIPS • Anthony MADGE • Stephen WELLS • Julie MCGEORGE • Richard OWEN • Jacques SARAZIN • Sarah HORRIGAN-FULLARD • Iain HICKMAN • James HICKMAN • Jessica SHANKS • Tim SORRELL • Joanna WARD • Niki WARD • Julie HUGHES • Fiona BEALES • Miri LEWIS • Judith CARTWRIGHT • Julie MATTHEWS • Emma COVERLEY and Tony DEANE. 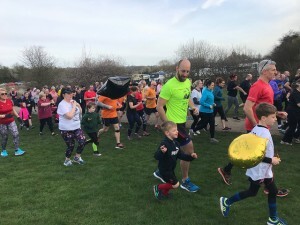 Photographs of our wonderful community event can be viewed here. 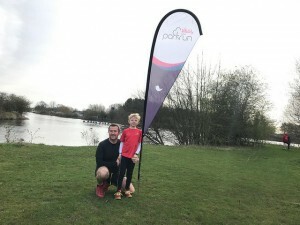 Colwick parkrun started on 25th June 2011. Since then 10,983 participants have completed 78,609 parkruns covering a total distance of 393,045 km, including 13,903 new Personal Bests. A total of 1,034 individuals have volunteered 6,547 times. Today's full results and a complete event history can be found on the Colwick parkrun Results Page. 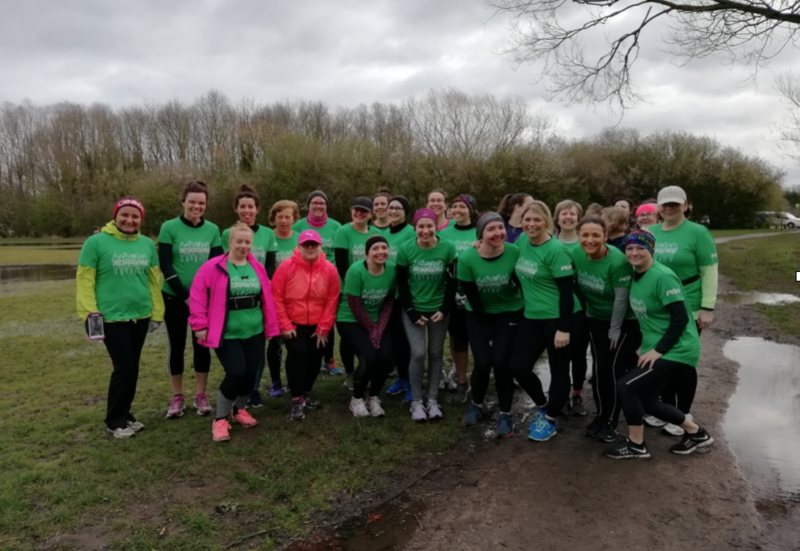 This week's run report has been written by Kelly, a regular tourist at Colwick and an honorary member of the Colwick parkrun family. 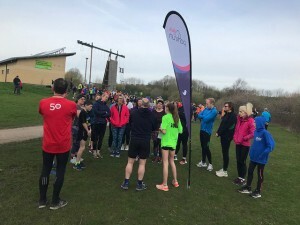 -- Congratulations to Colwick parkrun on their 400th event. 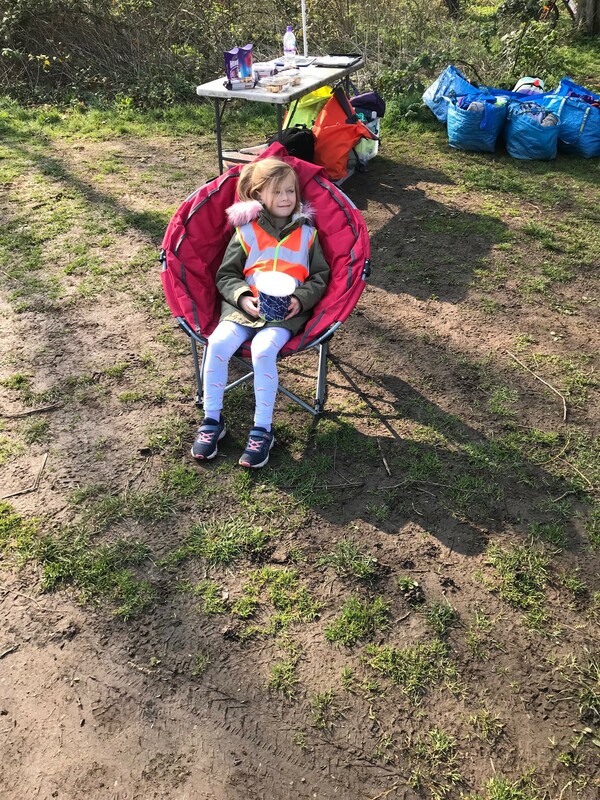 It was superbly brought to courtesy of 32 hi-viz heroes under the awesome direction of Team Dickens, chiefly Evie assisted by Stephen! 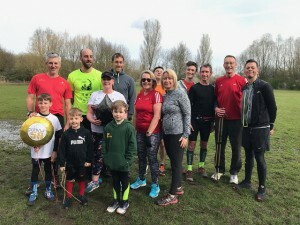 For the 400th run a fantastic 32 clubs were represented. We had runners at #400 who actually ran at #001! Huge thanks for sticking with us. 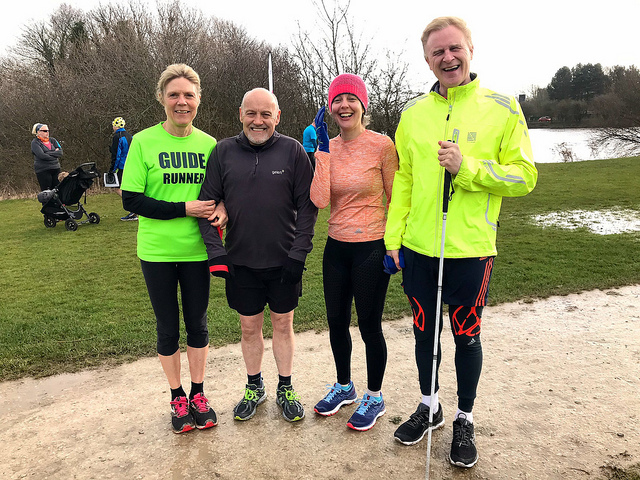 My parkrun actually started two weeks before with a message saying “I’ll be delighted to guide you on March 2nd”…this doesn’t sound huge but as a visiting visually impaired runner it is. Saturday was my 5th visit to Colwick and I certainly wasn’t disappointed. 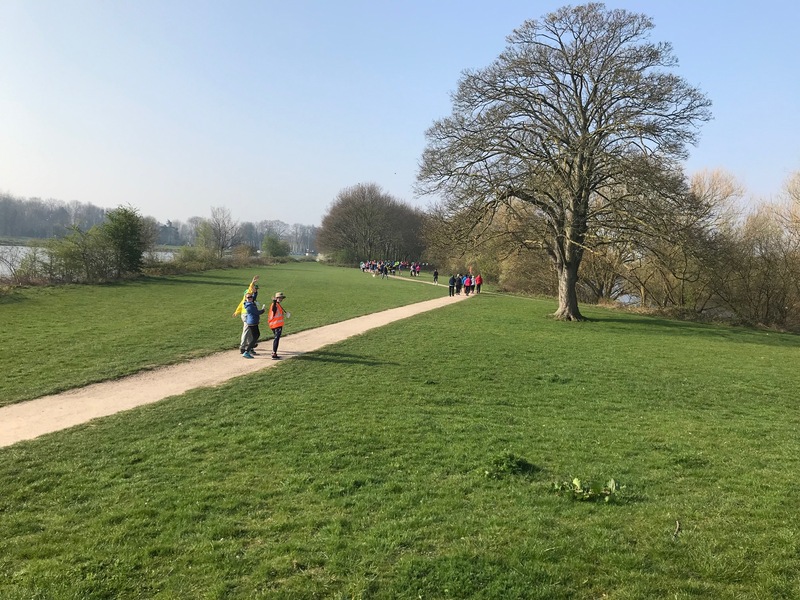 As a tourist who is visually impaired being able to find someone willing to guide can be difficult yet it is never an issue at Colwick. 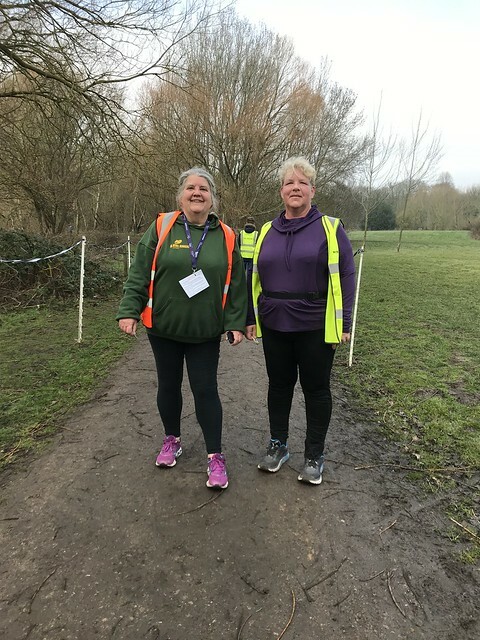 Terry and Iris, your resident blind runners, have a team of well-trained and confident volunteers. 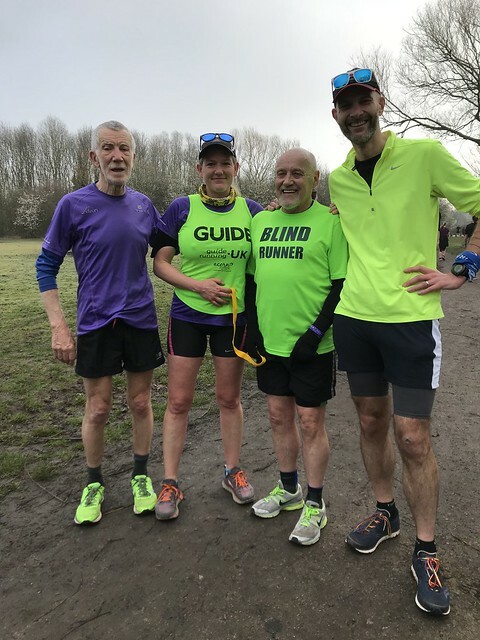 So once again Colwick had 3 visually impaired/blind runners doing the route. 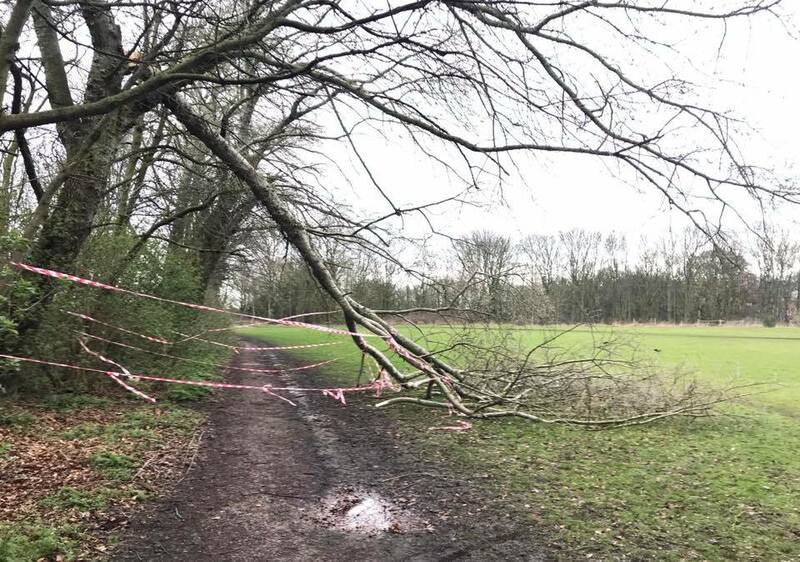 Ably guided by Arry, I avoided bins, overtaking runners, cars and low-flying branches. I didn’t end up sat in a muddy puddle, so that was a success! Unlike Terry and Iris, I have some vision but don’t have peripheral, so judging pot holes and slopes doesn’t work. I don’t run on a tether but more on the instructions of my buddy, and take their hand as necessary. 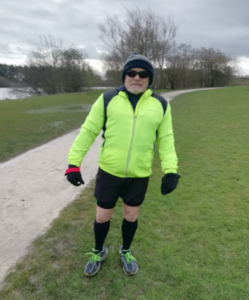 I do at times use the feet of the runner in front-this weekend it was the orange feet of Messi, a pink jacket belonging to a lovely lady and the white trainers of the lovely Welsh gent! They made me avoid puddles that Arry might have missed. 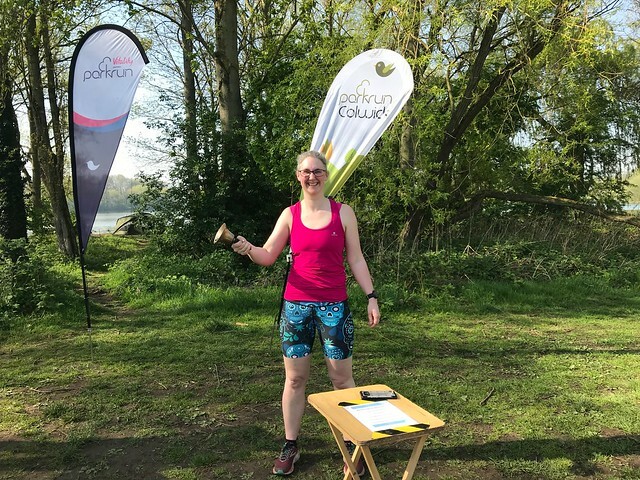 Colwick is a beautiful and attractive course, and Arry wasn’t without giving me descriptions of the key features of route and of the water glinting on the lake as I was cursing the sun for taking what vision I had! 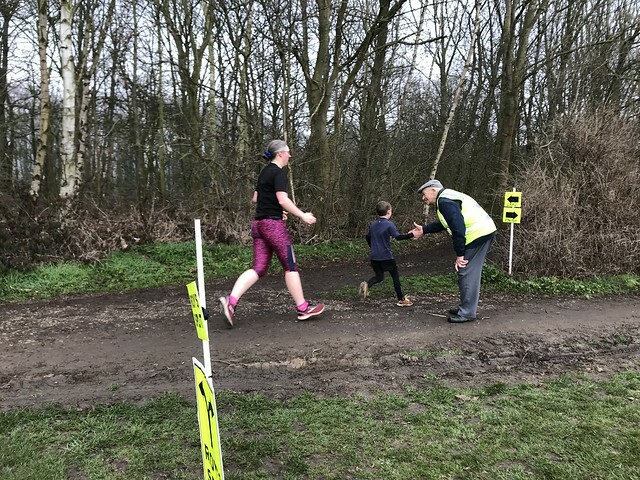 My home run is Sewerby, so not unlike Colwick with tarmac, gravel, and muddy woodland trail…only difference is Colwick mountain is a mere bump compared to Yorkshire hills. 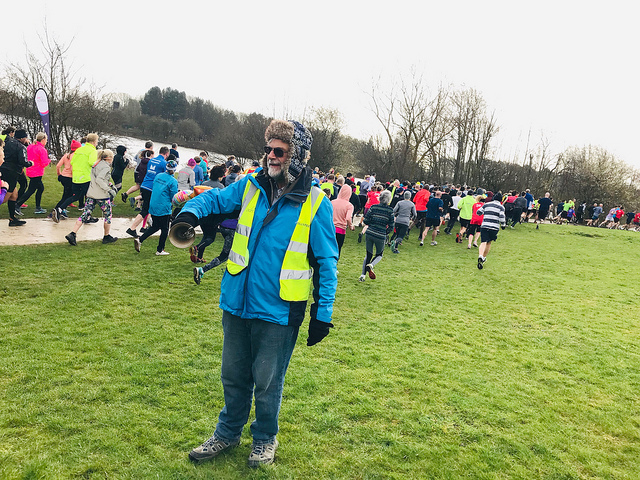 Not strictly parkrun #400 but I need to thank another of your hi-viz heroes, Tim, who at the 11th hour on Saturday afternoon stepped in to guide at the Rushcliffe 10km on Sunday. Without him I wouldn’t have been able to participate in my race due to my lined-up guide being injured. 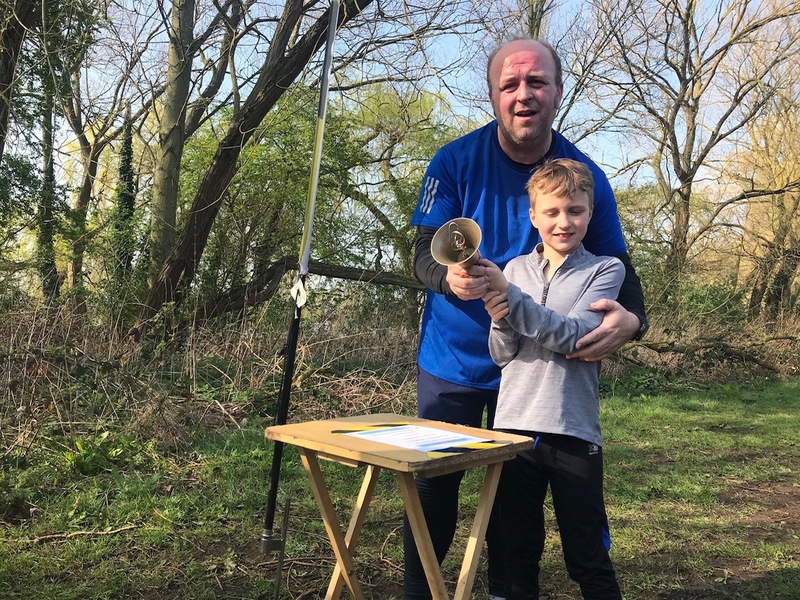 So thank you Colwick as without this connection I would have missed my race-he guided me to a new personal best! Kelly and Tim on Sunday. 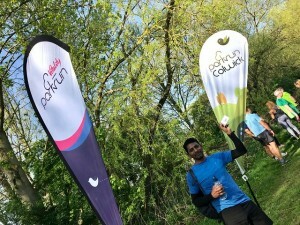 Coming to run at Colwick never makes me feel nervous I just feel welcomed into the parkrun family and accepted. 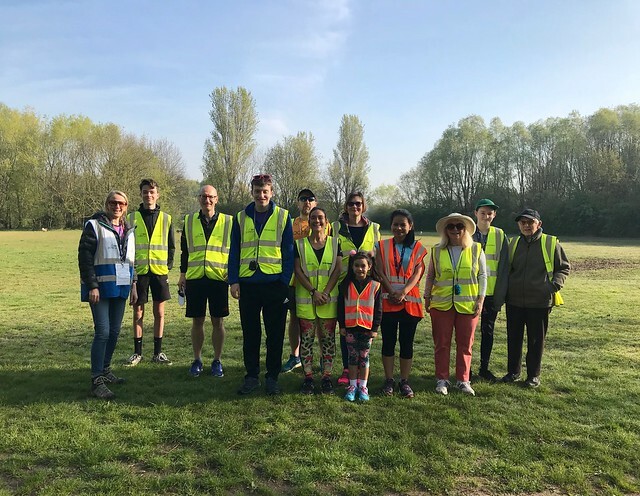 Thanks to this week's volunteers! And a special thanks to Kelly for this lovely report. See you on Saturday for event #401! This weeks run report comes comes courtesy of Terry, one of our VI parkrunners. 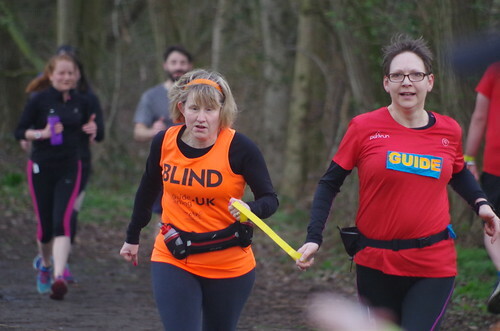 Being registered blind, I am often told that I’m missing out on seeing the beauty of the park and am asked by other runners how I manage at parkrun? 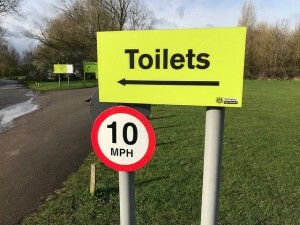 In particular, how I seem to know my way around the Colwick course? To answer these, here’s how it went on Saturday, for event 399. I was collected at home as usual and driven to Colwick by a volunteer; on this occasion it was SuperKev. 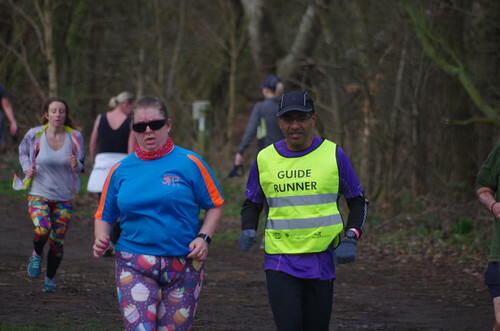 On arrival, Kevin passed me over to Caitlin Sorrell, my guide runner for the day. Like everyone else, Caitlin and I waited eagerly at the start as James and Iain gave a briefing to the 19 first timers. 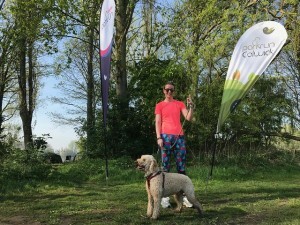 Run Director Abigail greeted the 243 runners and welcomed tourists from Chelmsford and France. As well as congratulating Julie Matthews on her milestone 50th parkrun, we welcomed Roy and Jackie’s visit and applauded the 25 volunteers who had donned hi-viz for the day. 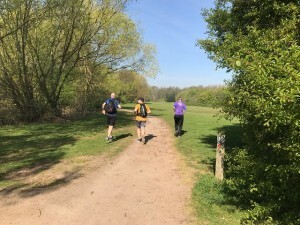 We were soon on our way, accompanied by greetings from fellow parkrunners as they passed us. Talking to me as we ran, Caitlin controlled our pace and prevented me from running into others and relayed information about the course and conditions. This meant giving me notice of oncoming turns, speed bumps, changes of surface and counting me down (5, 4, 3, 2, 1) to meet these and avoid any falls. Her non-stop description of our surroundings i.e. the stillness of the lakes, the colour of the sky, other runners – even breeds of dogs, allowed me to build a vision of the event we were part of. Hearing we were passing particular features, such as Roy’s split, Shoesucker straight, Children’s playground etc, along with positions of benches/bins/picnic tables, meant I knew where we were and could decide if I wanted to speed up or slow down. To anyone interested, we had 9 changes of surface and passed 35 benches, 17 bins, 11 speed bumps and 2 picnic benches. 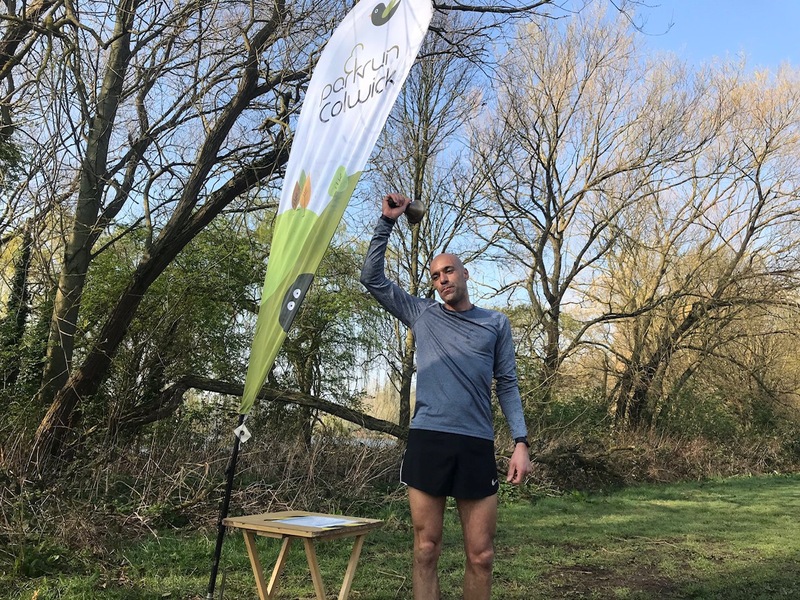 We went through 2 gates, 1 barrier, passed 5 parkrun distance markers (1 was missing) 1 wind turbine and 4 new wooden sculptures. We passed areas of new blooms, trees in blossom, very few puddles, hardly any mud, plenty of geese and a lone heron flying overhead. Most importantly, we had the encouragement of other runners, spectators and marshals; all of whom we thanked. 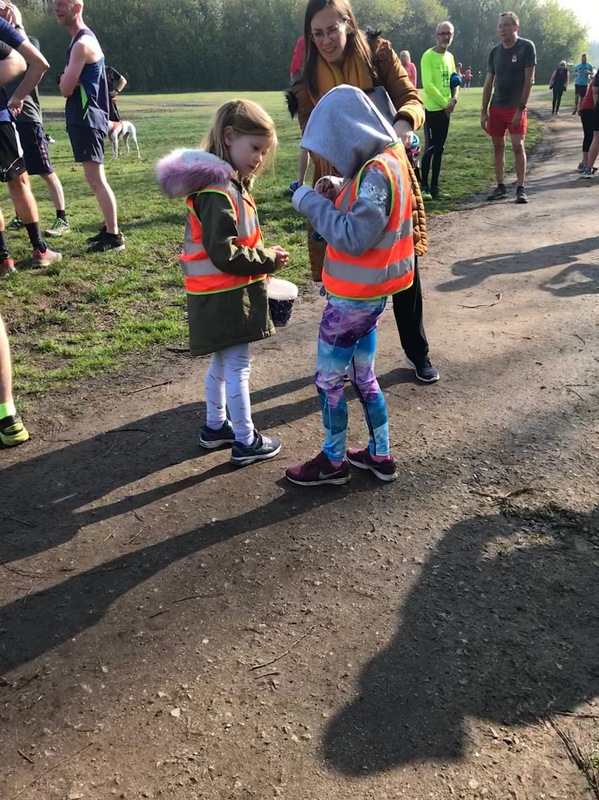 In no time at all, we ran through the 3 cones at either side which greeted the finish, passed the timekeepers and received our tokens and had barcodes scanned. 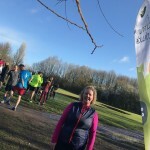 Another parkrun completed - where I probably “saw “ and enjoyed more of the park than most. 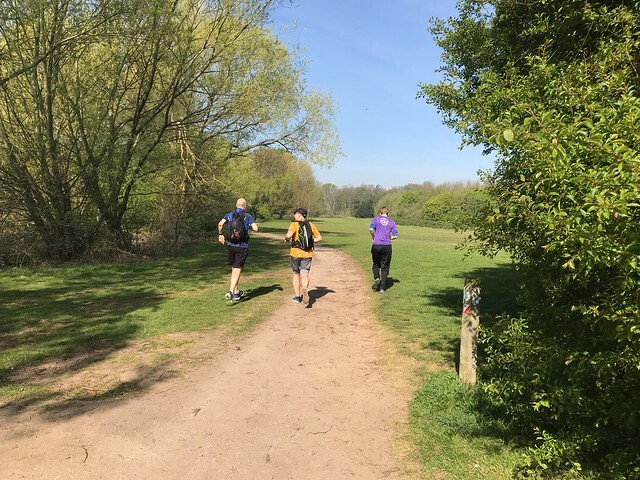 With the quality of my guide runners and support of the most friendly parkun imaginable, getting to and around Colwick is always easy and enjoyable. Plus, there’s the café afterwards. Here’s looking forward to next week. Many thanks to Caitlin and to the following volunteers who made it all possible. 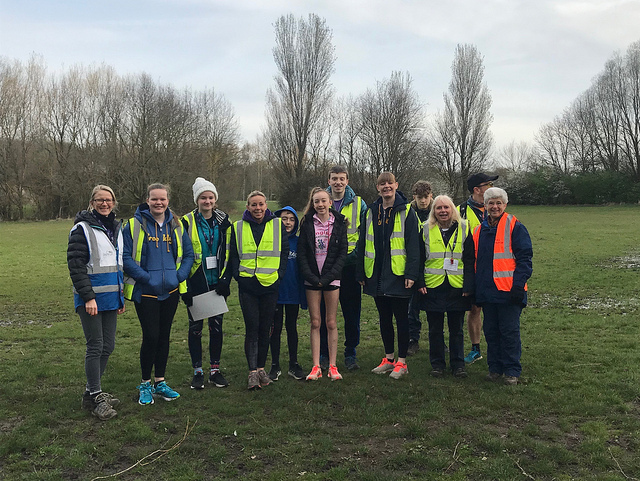 Laura and Tracey were our timekeepers, with Philip and Thomas barcode scanning and Joanna on the clipboard. SuperKev managed the funnel and Jacques gave out finish tokens. 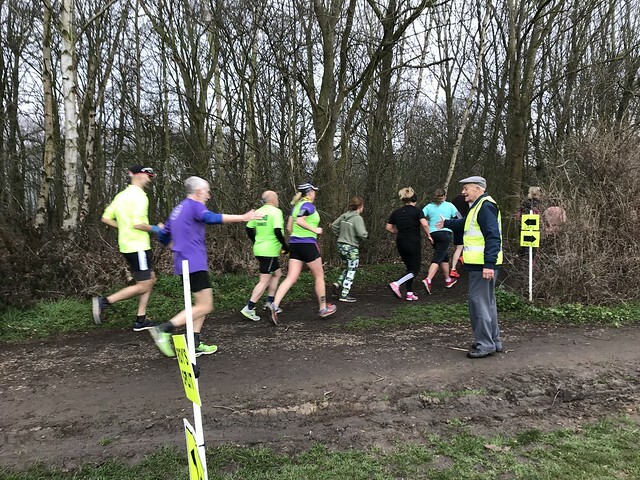 You were cheered and clapped round the course by your marshals Will, Lynsey, Neil, Scarlett, Maureen, Roy, and Jackie. Your tail walkers were Hilary, Libby, Louise, and Angie. syatb next week to do it all again! 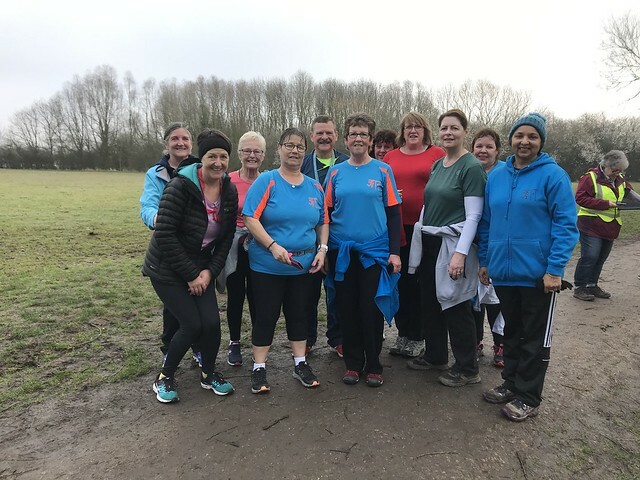 After last week's howling gale, the weather gods smiled on the 286 Colwick parkunners who were treated to an early taste of spring. Shoesucker straight was firm under foot, the 20 volunteers didn't get numb fingers and toes and some runners were heard complaining about being too warm (really, there is no pleasing some people is there?!). Did you spot the new sculptures? 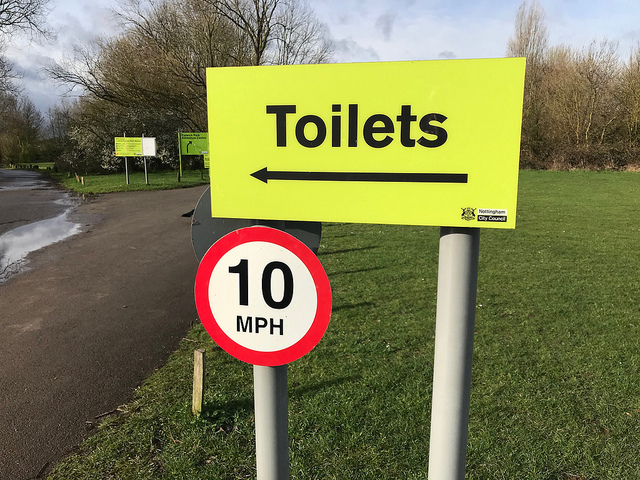 After the recent apparition of the signs at the entrance to the park, it seems our favourite park is getting all sorts of embellishments! Maybe one day we will even be treated to soap in the toilet blocs! Ian and James kicked things off by briefing our tourists (from Lincoln and Sheffield) and our first timers of whom there were 27. They also helped wrap things up in the Daleside by sorting out tokens. 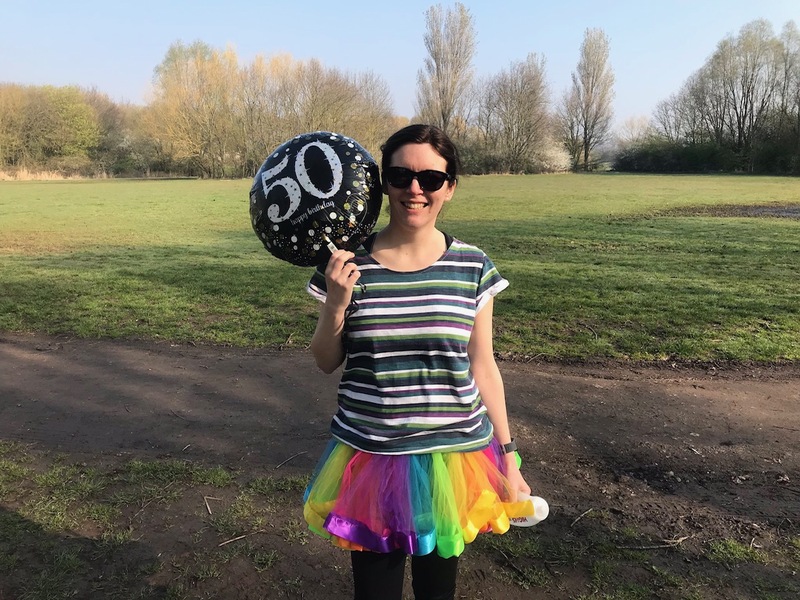 Congratulations to Amy, Daniel and Abby who ran their 50th parkruns and sorry for not capturing the momentous occasion on camera. Well done to all 49 of you who achieved new PBs - it goes to show what can happen when you don't have to dodge puddles and fight your way through the mud! Thank you to all our wonderful volunteers. Gideon (who looked like he had been at the park for hours by the time the run director got there) helped with the set up. 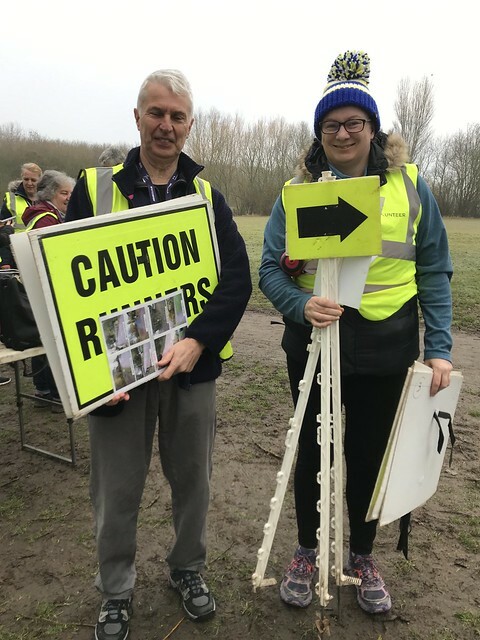 Steve and Abi were your timekeepers and Caitlin was your run director. Tim guided Terry and only crashed him into a bollard once. The funnel was expertly managed by Sandy, and Joanna handed out tokens even to those who were reluctant to take one (well done to both of them for keeping the funnel in order)! Jacques, Linda, Laura and Fiona scanned barcodes and produced one of the tidiest clipboards you'll ever see. The course was marshalled by Judith and Peter and your tailwalkers were Steve, Niki, Zach, Roo and Harjit. 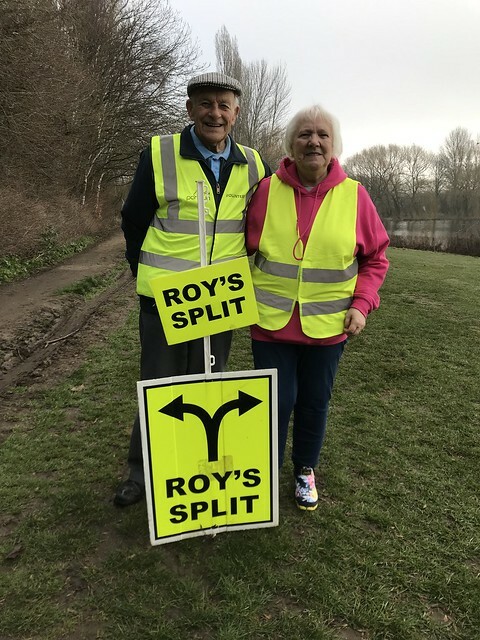 Finally, a particular thanks goes to Karen who, having run to Colwick, generously stepped in to the shoes of a missing marshal, and did a fab job at Roy's split.